Port Hardy is an excellent dive site with lots to see and explore. 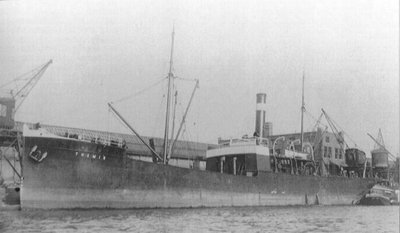 The Norwegian cargo ship ran aground on Crocker rock back in December of 1906 while steaming from Ketchican Alaska to Croften, BC. The SS Themis was 270 feet in length, but there is not much remaining that resembles the above picture anymore. Still there are a lot of identifiable pieces to be seen and what does remain of the ship is now home to some of the largest Ling Cod you will ever see, as well as several pairs of Wolf eels. As is usual in this area there is an amazing amount of Invertebrate life as well, which makes for many great photographic opportunities. Especially for you macro enthusiasts. I feel fortunate to have made this dive trip with a group of divers from Sundown Diving in Nanaimo, who along with myself were all staying at a floating resort called the "Hideaway" in Browning pass. It was the 2012 labour day weekend and the weather, visibility and diving was spectacular. John de Boeck and his staff put up great food and comfortable accommodation, and diving Browning Pass is awesome. If you go be prepared to be amazed and very tired! One other interesting fact I found regarding the SS Themis is that earlier that same year she also grazed the infamous Ripple Rock near Campbell River, and then crashed into the bluffs sustaining damage to her bow. I guess one could say it was only a matter of time!